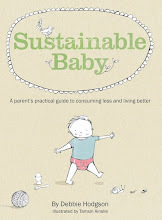 Sustainable Baby: Win a copy of the book?? Virginia is giving away a copy of Sustainable Baby, to someone who leaves a comment on something they do to help the environment, on her blog. I've just recently come across your site, after a friend raved about your new book. Congratulations on producing such a fantastic book and inspiring blog! As well as being helpful to me personally, your book is also very useful to me in working on a sustainability project for my local Council, as I can use the book as giveaways at the Sustainable Baby workshops were planning to run, and in our newsletter (we're giving away 4 copies of Sustainable Baby this month, but only residents of the Illawarra who subscribe to the Sustainable Illawarra email can enter). So thank you! I didn't know how to contact you so I sent an email to happy earth; did you get it?